Send your loved ones birthday wishes with this fabulous card from Paperlink! 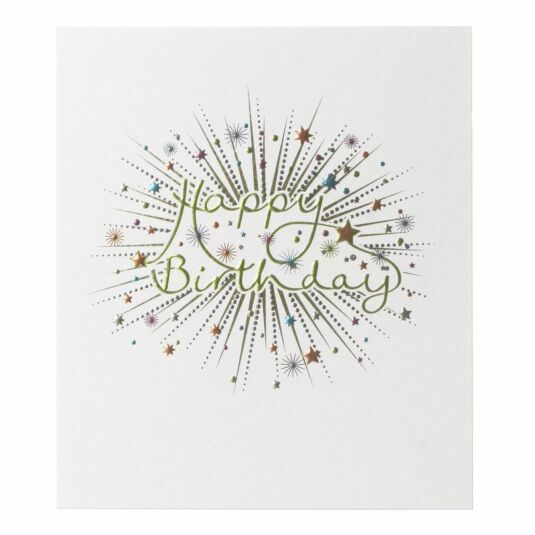 This textured white card has been designed with the words ‘Happy Birthday’ written in metallic green writing on the front surrounded by shiny gold decoration and multicoloured metallic stars. Written inside the card is the message ‘Happy Birthday’ with plenty of room for you to write your own message around it. The card comes with a brown envelope ready for to send near or far.